For Old and New Work allows you to mount LCD and plasma TVs, and other system components flush against the wall. 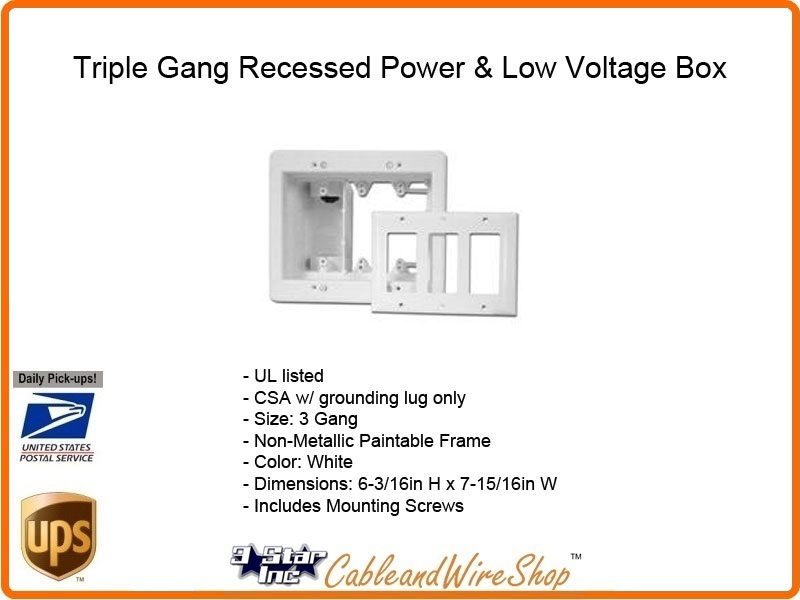 This 3-gang box is a combo box with half for power and half for Class 2 wiring of satellite or cable TV, speakers, surround-sound, etc. Mounting "wings" tighten against the wall board to hold the box firmly in place. Plugs stay inside and don't protrude past the wall. Provides for a secure installation. Adjusts to fit walls from 1/4in to 1-1/2in thick in retrofit applications Can be used with Arlington's SCOOP series entrance hoods and plates.